The Book of Ruth is read on Shavu’ot. There are many attempts to explain the name Ruth. There are lexicographers who derive it from re’ut, friendship, since her insistence on staying with her mother-in-law Naomi was so touching. 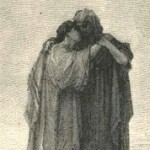 Others think it comes from the word ra’ah, to see, indicating her moral beauty – or, according to the Midrash, because ra’atah, she looked to the leadership of Naomi. There is a Talmudic opinion that the name is connected with her descendant David who delighted God (rivahu, coming from ravah) with his poems and psalms. It is interesting that in g’matria, the letters of Ruth add up to 606 which combines with the seven rabbinic mitzvot to make 613, the traditional enumeration of the commandments.